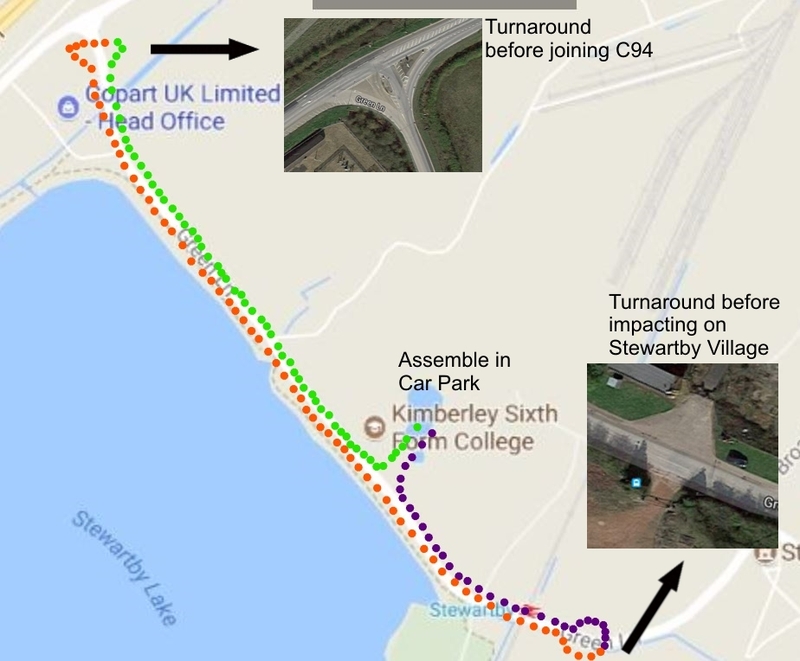 BACI are holding a protest to allow residents the chance to express their concern in the form of a demonstration on Green Lane the proposed access road for the Covanta Incinerator HGV’s. Covanta currently has planning permission for 594 HGV movements per day up and down Green Lane. This is not including staff vehicles and visitors. BACI is hoping to represent how crowded the proposed number of HGVs will make this – what is essentially – a village road and the impact on Kimberley College and local residents on a daily basis. We are organising a walking pace car parade and will issue numbers for each vehicle to display – up to number 297 to represent the number of HGVs. Green Lane between the entrance from the C94 (old A421) to the proposed Covanta Site entrance. At each end of this route vehicles will turnaround and return down Green Lane. There will be no need to join the C94 (old A421) or to go as far as the residential homes in Stewartby village. Please Click to View a map of the boundaries of the Route. Kimberley College has kindly given permission to use their car park for us to assemble and get into line before joining Green Lane. There will a road closure order in effect on Green Lane and police officers will be in attendance to manage traffic at each end of the route and provide support. BACI will have Marshalls in place to give additional support for traffic movements etc. Registration will be in Kimberley College Car Park where all vehicles should head for first. In order to take part – we will be asking all vehicle drivers to confirm that their vehicle is roadworthy and that they have insurance. Normal highways rules and regulations must be adhered to during the assembly and parade itself. We have checked with vehicle insurance companies and believe that all cover will remain the same – however – vandalism will not be covered. You may wish to check with your own insurance provider before attending. Vehicles will be issued with numbers to display up to 297 on the day. BACI is a group made up of volunteers and as such we are asking for a minimum of £1 per car to cover our overall costs (event insurance etc) – however – additional donations will be gratefully received. In order to show the geographical range and scope of the concern – we are asking that you complete and print off 2 copies of a poster to display in your vehicle that will show where or who you are representing. For example Wootton Resident or Ampthill Town Council or a Company Name or a Local Group Name. Please use the fillable PDF form with 3 areas for text input. To use with Chrome or Internet Explorer – just click on the link fill in and print from the form in your browser window. To use with Firefox opposite click then ‘save link as’ and save a copy to your local computer. Then open with Adobe Reader as a normal pdf – complete and print. Please click here to access the form to create your specific poster . We will have a limited number of posters with general wording like ‘Houghton Conquest Resident’ etc available on the day if you do not have access to a printer. There will some additional space for demonstrators to view the rally/parade from paved areas by the side of the road at Kimberley College. Please bring posters and banners to help get our message across. You can use the A4 size poster that can be accessed here – or feel free to make up banners with your own particular concerns or slogan. Please keep the wording family friendly. There will be a donation box located at the registration table. The BACI group is made up of volunteers so any donations towards our overall costs (event insurance etc) will be gratefully received. Any surplus donations – after event costs have been deducted – will be put towards the costs of any legal action we made need to take after this consultation. If it is deemed unnecessary to proceed with a legal challenge the surplus will then be donated to a local charity. Please be aware as with other similar events your participation is at your own risk and you are personally responsible to peacefully protest within the limits of the law. Join us and send a very loud and very clear message to Covanta, Veolia and the Environmental Agency just how ludicrous and dangerous these plans actually are. If you would like to volunteer and help as a traffic/crowd Marshall or helping register and number the vehicles as they arrive – please fill in the form below. Enter your email address to follow Bedfordshire Against Covanta Incinerator and receive notifications of new posts by email.